The Samsung Galaxy S3 has been the relatively undisputed heavyweight champ on the Android scene for half a year now. It is, quite simply, an awesome smartphone. 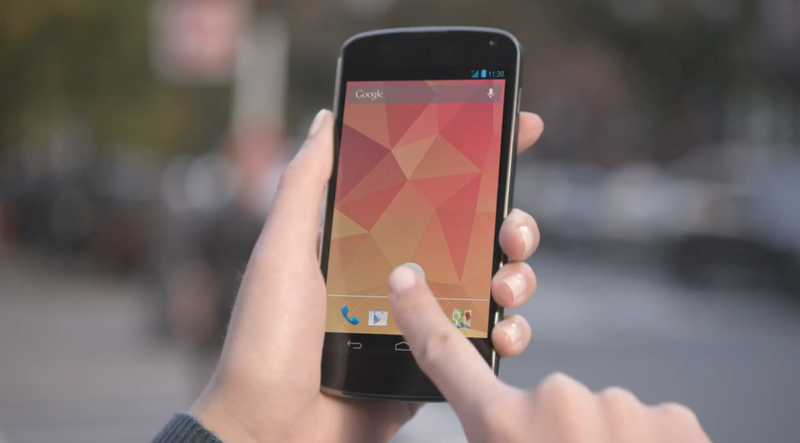 The new challenger emerging is the Google Nexus 4 and it’s looking lean, mean, and dangerous. Manufactured by underdog LG, the Nexus 4 combines impressive specs with an affordable price tag. The question is – does the Nexus 4 have what it takes to steal the title? Warm up for the main event with an undercard including our Samsung Galaxy S3 review and a detailed Galaxy S3 vs Nexus 4 spec showdown. The Galaxy S3 has been on the market for a while now and you can get it from various carriers, although there are some slight differences between versions. The Nexus 4 comes in two flavors – 8GB or 16GB – and it went on sale November 13. Let’s open the bout with the first thing that strikes you about both devices: the screen. The Galaxy S3 has been lauded and derided for having a huge display. At 4.8 inches, the screen size was criticized by some for making the phone too large to handle comfortably. Consumers clearly didn’t agree with the critics because sales have been impressive and there’s a clear trend towards bigger displays in the market generally now. The Nexus 4 has a slightly smaller display at 4.7 inches. The fact the Nexus 4 has a slightly higher resolution and a smaller screen than the Galaxy S3, means that the pixel density is greater. The Nexus 4 should be sharper. The displays also use different technology. The Nexus 4 display is IPS LCD and the Galaxy S3 is Super AMOLED (if you want to know what that means check out AMOLED vs LCD). Both displays have great color reproduction and good viewing angles and they both have Gorilla Glass 2 protection. The Galaxy S3 might edge it on better viewability in sunlight and that extra size, but the Nexus 4 display is sharper. Neither Samsung nor LG are famed for high quality construction when it comes to smartphones. The Nexus 4 has a rounded form factor and is made of plastic with glass front and back and a chrome style rim. When the light catches the back you’ll see an eye-catching hologram design. It’s a premium look and feel not generally associated with LG, but it is indicative of the company’s push towards the top end of the Android market. The Galaxy S3 is also rounded with a slightly textured pattern on the border which carries round onto the plastic frame and polycarbonate back cover. There is a single Home button on the front, while the Nexus 4 has no physical buttons on the front. Despite claims that the plastic feels cheap it is very durable and it obviously helps to keep the weight down. In terms of size the Galaxy S3 is slightly bigger in height and width, but it is also slightly slimmer and it weighs a touch less. Ports and buttons are virtually identical, including right side placement for the power button, which helps you reach it more easily on larger form factor smartphones. As a Google release the Nexus 4 is vanilla Android and it sports version 4.2 which offers a handful of slight improvements over 4.1, but is still classed as Jelly Bean. There’s a new Quick Settings screen, widget support on the lock screen, improved Google Now, and Voice Search, among a few other new bits and pieces in version 4.2. The Galaxy S3 launched with Android 4.0 (Ice Cream Sandwich), but the Jelly Bean 4.1 update has rolled out to many devices already. It also has Samsung’s TouchWiz interface, which has already added some features such as a Quick Settings menu in the Notifications bar. There isn’t a huge difference in usability, but the latest version of Android is always the best. The 4.1 update for the Galaxy S3 brought a very noticeable improvement in speed and performance, alongside great features like expanded Notifications and Google Now. An S3 with Android 4.0 and TouchWiz is definitely behind the Nexus 4 with vanilla Android 4.2. Both devices have quad-core processors. The Galaxy S3 has a 1.4GHz Exynos 4412 and the Nexus 4 is sporting a Qualcomm Snapdragon S4 Pro clocked at 1.5GHz. The Nexus 4 has 2GB of RAM, which outperforms the 1GB of RAM in the European and international versions of the S3. The U.S. version of the Galaxy S3 matches the Nexus 4’s 2GB of RAM but lags behind with a dual-core processor. The Nexus 4 comes in 8GB and 16GB versions and in typical Nexus-style there is no microSD slot. You’ll need a screwdriver if you want to open it. The Galaxy S3 comes in 16GB, 32GB, and 64GB varieties and you can expand by a further 64GB thanks to the microSD slot which you can get to by removing the back cover. There is no contest here. When it comes to the main camera, both devices have excellent 8-megapixel rear-facing cameras that can record 1080p video at 30 fps. They also both have the usual LED flash, face detection, and a host of other features. Android 4.2 brings a cool new Photo Sphere feature for panoramas to the Nexus 4, but the Galaxy S3 camera app has some nifty features, too. It’s easier to separate the two phones on the front-facing camera because the Galaxy S3 has a 1.9-megapixel camera and the Nexus 4 has a 1.3-megapixel camera. Do many people really care about the front-facing camera? For those that do, the S3 wins out. Both phones have batteries rated at 2,100mAh. The Galaxy S3 battery is removable while the Nexus 4 battery isn’t, but few people will carry around a second battery anyway. We’ll need to wait for more extensive hands-on testing to see if there’s any real difference in actual use, but . It’s probably worth mentioning that the Nexus 4 does support wireless charging and has a nifty Wireless Charging Orb accessory, although you do have to buy it separately. You’ve got NFC, Wi-Fi, Bluetooth, DLNA, and everything else you would expect to find on both smartphones. The widely noted difference is that the Nexus 4 doesn’t support 4G LTE. It’s debatable how much that matters, because HSPA+ can be very fast, but if you live in the right area then LTE is the fastest mobile network connection you can have right now so it was a surprising omission. This is where some of the losses above for the Nexus 4 can be cancelled out because it is significantly cheaper than the Galaxy S3. It is basically $300 for the unlocked 8GB Nexus 4 or $350 for the 16GB version. That compares to around $600 for an unlocked 16GB Galaxy S3. On contract you can get the Nexus 4 for $200 while the Galaxy S3 is closer to $300. If we add up the scores it actually turns out to be a tie with 3 wins apiece and 3 draws, but hopping off the fence we’ll give this one to the Nexus 4 because it manages to offer more value for your money. The wins that the Nexus 4 racked up will probably be more important to most people – it’s faster, it has the latest version of Android, and it’s cheaper. However, if you’re on a carrier with a robust 4G LTE network, or you heavily value storage or the quality of your front-facing camera, the Galaxy S3 may be the phone for you.